Expert advice about how to sort through the various types of roofing to choose the best one for your home. If you’re thinking about buying a new roof, be prepared to pick from possibilities that range from the familiar to materials you never knew existed. In this article, we’ll help you become more acquainted with your options and the features you should consider when comparing one to another. Then we’ll point you to more detailed information about each roofing material. Some roofing materials, such as slate, wood shakes, and copper, have remained virtually unchanged for centuries. But a considerable array of other roofing materials have joined them, from the perennial favorite, asphalt-fiberglass, to newer products made from fiber cement, concrete, and plastic composites. Most of these have been developed over the past couple of decades with an eye toward greater durability, easier installation, lower cost, sustainability, and other features homeowners want. Each has its own benefits and drawbacks. The trick is to sort through the many options and pinpoint the right one for your roof. Slope is determined by the amount a roof rises over a 12-inch run. “Pitch” is another way of expressing the slope, using a fraction. Based on a roof’s rise (height) and span (width), pitch is the rise over the span. For example, if your house is 38 feet wide and the gable roof has a 1-foot overhang on each side, it has a span of 40 feet. From the eaves to the peak, it’s 10 feet high—that’s the rise. Figure 10/40 and reduce that to 1/4. It has a 1/4 pitch. Most shingles, tiles, and slate-like materials are approved for use on roofs with a 4-in-12 or steeper slope. 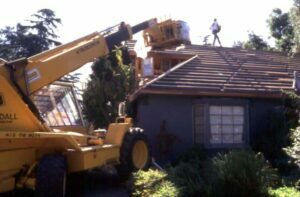 Low- or flat-pitched roofs must be topped with materials that are seamless, such as built-up tar-and-gravel or sprayed polyurethane foam. If they’re not, they’ll leak when water pools on the surface. Because the roof is typically very visible from the street, appearance of a roof material will often dramatically affect the look of a home. 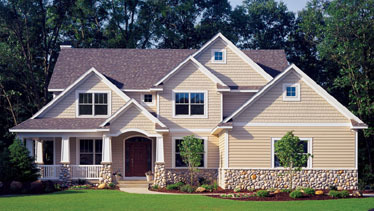 The color, texture, and type of material should be compatible with your home’s exterior finish and style. Spanish tile only belongs on a Spanish or Mediterranean style home. 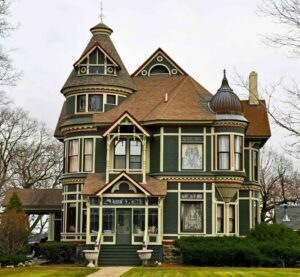 Be true to your home’s architectural style. Don’t put Spanish tile on a Colonial-style house, wood shingles on a Spanish-style house, or metal roofing on a 60’s ranch house. In other words, choose a material that will be consistent with the design vernacular of your home. This doesn’t mean you can’t stray from the original material. 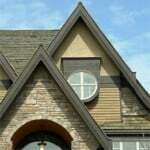 Most new products are made to mimic the look of original roofs. 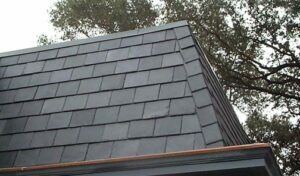 Fiber cement shingles look like wood or slate. Metal and concrete can look like tile or wood. Note: Some materials are better than others at imitation, so be sure to see what the product looks like on an actual roof (not a photograph of a roof). Color tone may be a concern. A light-toned roof reflects more heat than a dark roof. If you live in a hot climate, consider light tones. Conversely, if you live where heat gain would be more of a benefit, consider dark tones. The cost of a new roof can vary dramatically, depending upon the material and the complexity of the job. The cost of a new roof can range from relatively affordable to unbelievably expensive. 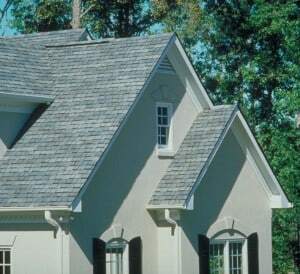 The main reason that asphalt-fiberglass (composition) shingles are by far the most popular roofing material is that they are among the least expensive, both to buy and to install. For materials only, asphalt shingles run about $125 per square (100 square feet). Wood shingles cost about $180 per square. Clay tiles are about $210 per square, and steel roofs cost about $500 per square; you can spend up to $1100 per square for a copper roof. 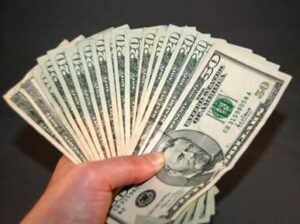 Generally speaking, labor charges are roughly equal to material prices. 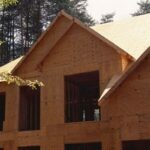 The complexity, height, and steepness of a roof can affect labor cost. If you intend to stay in the house for several years, be aware that the ultimate cost of a material is a factor of its durability. For an inexpensive material such as composition roofing, you might only spend half the cost of a pricier product. But if the pricier product would last more than twice as long, you’re not saving money in the long run because you may have to replace the roof again in the future. Because installing a roof is an expensive, disruptive job, it’s usually worth it to pay more for materials that have longer life spans—especially if you intend to remain in the house for more than 6 or 7 years. Always check the warranty, and understand the coverage offered. Pay attention to the details, especially anything that could void the warranty. Some materials, such as concrete tile, require special roof structure and heavy-duty equipment for loading. The weight of roofing materials is always a concern, because the structural framing of a roof is only designed to carry a certain amount of weight. If you choose a material that, combined with the substructure, will exceed that limit, you’ll need to beef-up the framing. Doing this definitely takes time, adds to the hassle and mess, and increases the cost. Tile, slate, and masonry materials are especially heavy—some are 1000 pounds per square—so be sure to check out the specifications and your roof’s structure if you’re considering one of these. The weight also affects the installation. Lightweight materials are easier to load onto the roof and handle during installation. And some lightweight materials, such as asphalt shingles and composites, often can be installed directly over the top of an existing roof. The fire resistance of roofing materials and the sheathing beneath them is rated by the Underwriter’s Laboratories (UL). Ratings run from Class A to Class C, and some materials—such as untreated wood shingles—don’t qualify for a rating. A Class A rating indicates that the roofing material is most effective against severe exposure to fire. A Class B roof won’t catch fire under moderate exposure. 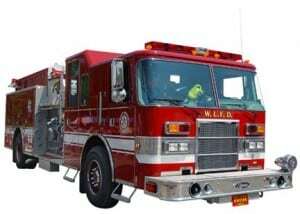 A Class C roof can only handle minor exposure to fire. Unrated materials should not be used where fire is an environmental hazard. Here’s a quick look at common roofing materials. For more detail, go to the articles mentioned in each description. Please note that prices and weights are given “per square,” meaning 100 square feet. Note that the materials shown here are for sloped roofs. For information on flat-roof materials, see Built-Up (Flat) Roofing. Price is the major benefit of choosing asphalt shingles. They typically cost from $200 to $250 per square, installed. Unless you’re after a material that is better for your home’s architectural style or historical purity, asphalt shingles are probably going to be your best value. Within the asphalt shingle category, you’ll find a wide range of qualities, distinguished primarily by longevity, appearance, and price. The best of the bunch, called laminated or architectural shingles, are thicker and more textured, and they do a better job of imitating wood or slate. Though they might be termed 30- or 40-year roofs, be advised that, in most situations, they will do well to reach the age of 20. Depending upon the type, they weigh from 230 to 430 pounds per square. For more, see Asphalt Roofing Shingles Buying Guide. 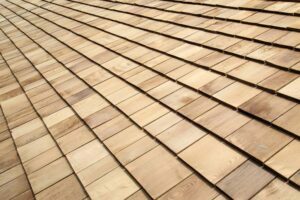 Cedar shingles offer a natural, woodsy look. Wood shingles and thicker wood shakes have a wonderfully natural, woodsy look. They’re easy to handle and install, lightweight, and will last for 15 to 25 years or, for shakes, up to 50 years. On the downside, they must be treated with fire retardant in fire-prone areas or may not be allowed at all. Installed cost typically runs from $300 to $500 per square. For more, see Wood Shingles & Shakes Roofing Buying Guide. If you’d like the classic look of slate without the extreme expense and weight of the material, check out some of the new slate-like alternatives made from plastic composites, fiber cement, or real slate with a waterproof backer that are currently on the market. They have a Class A fire rating, and they resist insects, rot, and mildew. Expect to pay $250 to $500 per square (installed) for slate alternatives. For more, see Slate & Slate Alternatives. 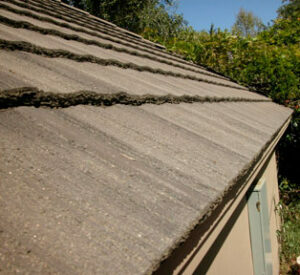 Concrete tile roofing looks similar to wood shakes, offers very high durability. Clay Spanish-tile roofs are particular popular in regions where Spanish and Mediterranean-style homes flourish. Though real clay tiles are prone to breakage and are extremely heavy, weighing in at 900 to 1000 pounds per square, lighter weight, less fragile tiles are made from concrete. You can also buy flat, shake-like concrete tiles. 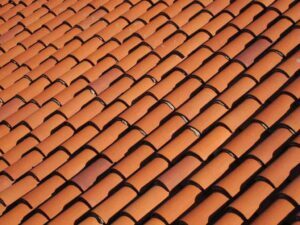 Like clay tile, these will last for 50 years or more, have Class A fire ratings, and resist rot, insects, and mildew. The cost from $400 to $700 per square, installed. For more about tile and masonry roofing, see Concrete & Masonry Roofing Buying Guide. 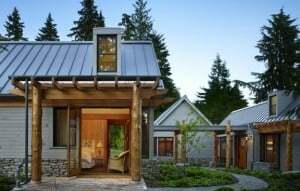 Made from steel or, in some cases, aluminum or other metals, metal roofing is sold in large panels or smaller shingle-like sections that resemble shakes, tile, or slate. Metal is resistant to fire, insects, rot, and mildew. 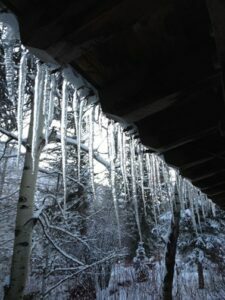 It does a great job of shedding water and snow, making it very popular where heavy snow is common. It will last for 20 to 50 years, is relatively lightweight at 50 to 200 pounds per square, and—depending upon the deck beneath it—may have a Class A fire rating. Drawbacks are that it can be dented, is noisy during heavy rain or hail, and can contribute to excessive heat gain. Expect to pay $700 or more per square for a professionally-installed metal roof. For more about metal roofing, see Metal Roofing Buying Guide.